Horoscope of Lady Diana - 8th House and Mystery Continues. Birth Details and Chart Details. Main Points of Lady Diana's Chart. Birth Details and Chart Details - As per the information available online, Lady Diana was born on 1st July, 1961, 7.45 PM at Sandringham, Norfolk, UK. As we can see that she was born with Scorpio ascendant/Jyeshtha Nakshatra with Jupiter-Saturn in 3rd house/Capricorn/Sravana-Uttarashadha, Moon-Ketu in 4th house/Aquarius/Dhanishta, Venus in 7th house/Taurus/Krittika, Sun-Mercury in 8th house/Gemini/Ardra and Rahu-Mars in 10th house/Leo/Magha. On some sites, there is a Sagittarius ascendant chart available which I think is because of difference in degrees of tropical vs sidereal. As I deal with sidereal system, I am fine with using Scorpio ascendant chart for her. She was Scorpio ascendant and lived a trademark Scorpio life of big changes and sudden events. She also carried that magnetic personality and attractive eyes which is another Scorpio trademark. Ascendant lords are Mars and Ketu. Mars is in 10th house/Leo with Rahu and Ketu is in 4th house/Aquarius with Moon. It shows that focus of her life was dealing with matters of Govt (10th house) and Kingdom (Leo & Magha). Rahu's presence with Mars made her rebelius but added the weirdness in her relation with Kingdom or Royal Dynasty. Ketu with Moon & in 4th house shows separation from Mother and she was separated after divorce of her parents as her Father won the case of her custody when she was only 6-7 years old. 10th house lord Sun with Mercury in 8th house/Gemini/Ardra indicates her troublesome relations with Monarch. Sun in 8th house also shows that her ego was continuously thrashed by people around her. Moon in Aquarius makes her humanitarian and she was seen as a person who raised the voice of people on major concerning issues. After a not so happy marriage with Prince Charles, she seemed to dedicate her life to people's cause and her voice was heard. It was very unusual for a Royal Family that their family member directly interacts with people and voice their concerns. She seemed to have an extra-marital relation which is seen from her debilitated Jupiter with Saturn which we will discuss going further. 7th house has Taurus sign and its lord is Venus sitting in 7th house. So, it looks like a WOW married life for her, but it was not. Venus and Taurus only gave her a rich and good looking spouse. But that was not all. She married Prince Charles in July, 1981 and from Feb, 1982 till her sad demise, she was in Jupiter MD. Jupiter was debilitated and it was with Saturn. Jupiter represents Husband and Saturn is Cold Planet. Hence, a cold and loveless married life. Although, this creates a neech bhang raaj yoga for Jupiter but all these yogas help in professional life, not in personal life. So, she got recognition for her work but no love in marriage. This was also the reason behind her rumored extra-marital affair as Jupiter represents Morals and it being weak means person can compromise on moral issues. Last but not the least, Moon remains a relationship planet in any case as Moon shows our ability to compromise and adjust in relationship. Her Moon was in Dhanishta Naksatra, a nakshatra of Celibacy. So, no surprise that she had a loveless marriage and she felt like stuck in Royal Family. Mars represents Courage and when it is with Rahu, the courage gets overblown. It becomes a kind of rebellious person. And they both were in 10th house/Leo/Magha. So, all her rebellious attitude was directed at Govt, Kingdom, Monarch or Royal Family. Leo is also sign of Fame and Celebrity Status. Rahu there again overblown it and the result was that she was the one in Royal Family who received maximum attention or coverage from media. It may be a reason behind Royal Family's jealousy towards her. And then Sun, which represents Govt and Kings, in 8th house adds to all these things and gives her unstable relation with Monarch. Dasha/Transits around her Death - Now, we come to the point where similarities can be seen in her circumstances of death with Divya Bharti's. She died in a Car Crash on 31st Aug, 1997. 8th house represents sudden events and accidents. She was under Jupiter MD. Jupiter is debilitated in 3rd house. It is 8th from 8th house and has the similar energy of 8th house. Jupiter is with Saturn and Saturn rules her 4th house of Vehicles. She died in a Car Crash. Then she was under Rahu AD from Sep, 1995 to Feb, 1998. Rahu is in 10th house. What connection with 8th house? Well, Sun-Mercury both are in Ardra Nakshatra in 8th house. It is ruled by Rahu and represents chaotic events. Hence, 8th house directly got involved in Rahu AD. But then again, it was 2.5 year long time. Why it happened precisely on 31st Aug, 1997? Then she was under Sun PD from 20th Aug, 1997 to 3rd Oct, 1997. Sun is again in 8th house in Ardra Nakshatra. So, 8th house got double activated. Still, the question remains as to why on 31st Aug, 1997 out of these 44 days? 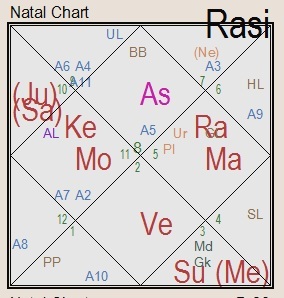 Then she was under Rahu SD from 28th Aug, 1997 to 4th Sep, 1997. So, 8th house got triple activation. Let's go one more step and we will find that Prana Antardasha on 31st Aug, 1997 itself was of Mercury. Mercury is again in 8th house in Ardra Nakshatra. Mercury is travelling and 8th house is major accidents. Jupiter was again debilitated in transit in Aug, 1997. So,it was her Jupiter Return. It was also her Nodal Return in 1997 as Rahu was in Leo and Ketu was in Aquarius. Moreover, Sun-Mercury were transiting in Leo only in Aug, 1997 very close to her birth and transiting Rahu. Last but not the least, Solar Eclipse was on 2nd Sep, 1997. 2 days after her death. Conclusion - So, we can see that in both cases of Divya Bharti and Lady Diana, there was complete activation of 8th house which brought their sudden demise. As 8th house remains the house of secrecy, both the cases remained mysterious and there is a lot to do to bring the truth out. But as it is house of secrecy, I doubt if ever truth will be out. Also, we can see that in both cases there was double-triple activation of 8th house along with transits which brought the results. So, there is no need to fear if someone only has one or two planet sitting in 8th house. Osho had 5 planets in 8th house and he lived for more than 60 years. I have 2 clients who had 4-5 planets in 8th house and they are living a healthy life. As always, Chart + Dasha + Transit = Event. As always, thanks for requesting. @ Hesley - Pls apply for specific consultation under consultation/services tab. Very well explained sir. Sir I and my friends would like to request a chart to be interpreted for educational purpose. The girl by the name Natascha Kampusch whom got kidnapped for 8 years. Even a movie was made based on her story called "3096 Days"...we would very much like to know what factor in her chart got her kidnapped and what made her got the release after 8 years. Her details we got: 17th feb 1988 6:45am wiener austria. We are looking forward for this discussion. Sir, Thanks !!! marvellous explanation Sir!!! eagerly awaiting for your next article!!! stay blessed with super wisdom!! !